Our partner, the Center for Creative Leadership (CCL), offers numerous publications directly related to the lessons learned in our programs. Please visit CCL’s publication site to view their extensive library. Online reviews and purchasing are also available. What’s your entrepreneurial style? For centuries, entrepreneurs have been placed in one box. In fact, the common mindset has been, “If it worked for one entrepreneur, it will work for every entrepreneur. After all, entrepreneurs are all the same.” But, are all entrepreneurs really the same? Sure, we can intuitively deduce that not everyone is a “Richard Branson” or a “Donald Trump”, and not everyone innovates like the late Steve Jobs, but is there more to it than meets the eye? 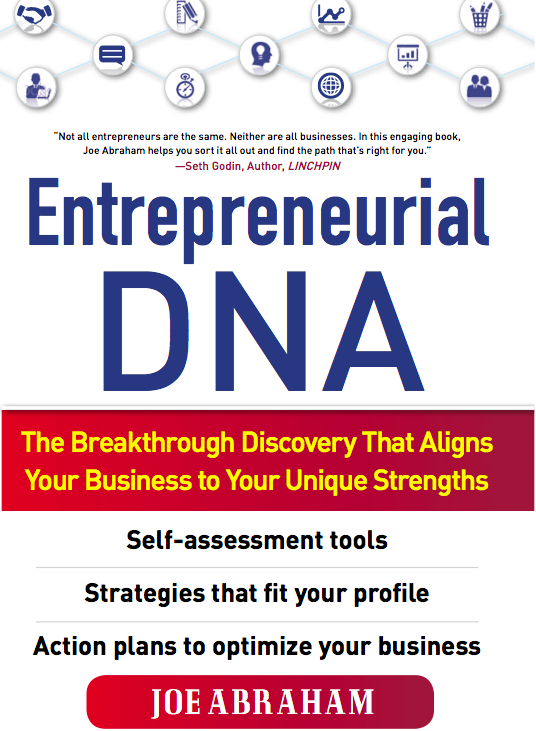 Entrepreneurial DNA proves there are massive implications to how each individual is wired as an entrepreneur. It shatters the archaic notion that one-size-fits-all and allows each reader to discover their unique DNA. 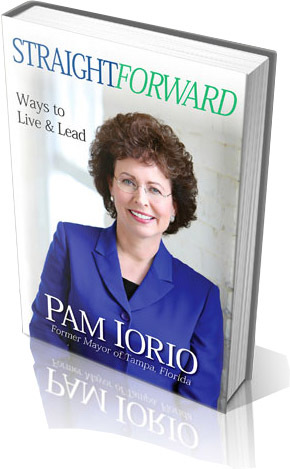 In Straightforward: Ways to Live and Lead, Pam Iorio examines the qualities, traits, characteristics and competencies of the straightforward leader. It is for the individual who is ready to improve his or her leadership abilities and achieve more. Straightforward leadership is distinctly direct, clear, honest, strategic, and respectful. It provides room for compromise and seeks to bring people together instead of dividing them. This brand of leadership is pragmatic, not ideological; solution based and results oriented. It empowers others and recognizes the importance of on-going development, learning and change. 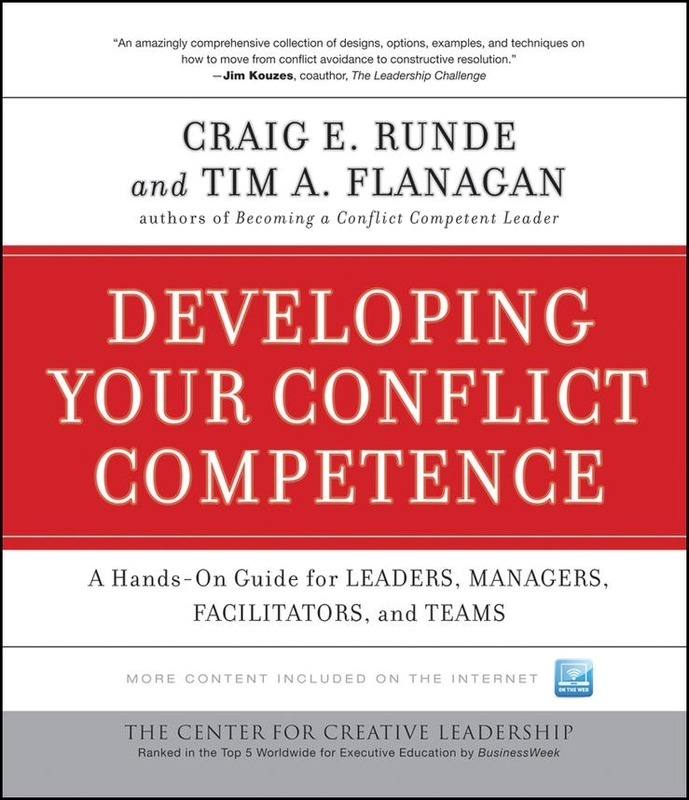 LDI instructors, Craig Runde and Tim Flanagan, are the co-authors of a third new book entitled, Developing Your Conflict Competence. The book, published by Jossey-Bass as part of their Center for Creative Leadership series, provides practical suggestions and exercises for improving the ability of individuals, teams, and organizations to manage conflict effectively. A number of the techniques and stories were provided by CDP users. 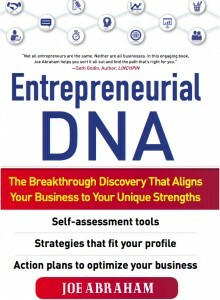 Jim Kouzes, co-author of The Leadership Challenge, call this, “A must-see guidebook for the new age of global business. This book shows every leader how to turn feelings of fear into feelings of safety, suspicion into trust, and competitiveness into collaboration. Purchase this book now from Jossey-Bass! When at least two people are together for any length of time, conflict is inevitable. For teams, conflict can be destructive. Can that conflict be leveraged? 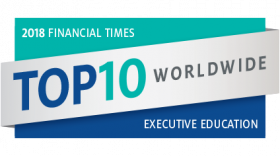 Craig Runde and Tim Flanagan, educators at the Leadership Development Institute at Eckerd College, believe that every team can learn how to deal with conflict. 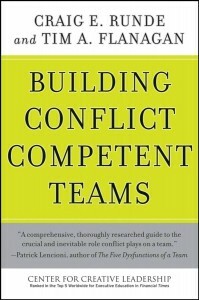 After interactions with hundreds of individuals in the field, in the assembly line, and from every rung of the proverbial business ladder, Runde and Flanagan’s new book, Building Conflict Competent Teams(Jossey-Bass, June 30, 2008), provides team leaders and members with the skills and confidence to engage conflicts in ways that work for the team’s advantage. 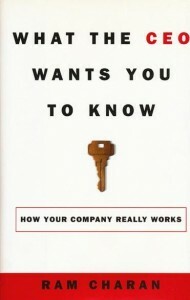 As a follow-up to Becoming a Conflict Competent Leader (Jossey-Bass, 2007), Runde and Flanagan’s second book explains how team conflict often begins, offers methods on how to handle conflict effectively, and makes specific suggestions on how to harness the upside of conflicting ideas and viewpoints. 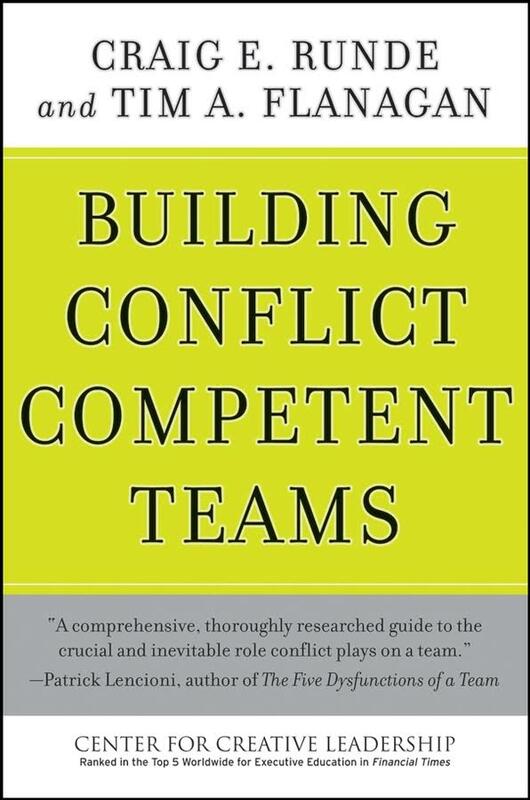 Through engaging examples, stories, and interviews that provide insights into the ways teams handle their differences, the authors outline the skills, tactics and competencies team leaders and members can use to address conflict when it occurs. Building Conflict Competent Teams is a guide for anyone who wants to develop the self-awareness and constructive behavior patterns that will enhance their team experience. Purchase this book now from Jossey -Bass! Becoming a Conflict Competent Leader gives leaders an insight into the importance of handling conflict effectively. 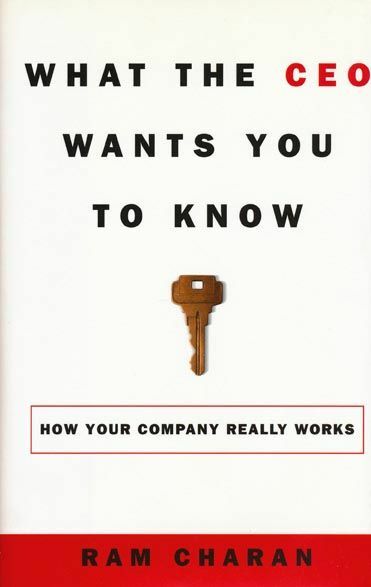 It also provides them with a roadmap of how to ensure that they and their organization become conflict competent. Conflict is an inevitable fact of organizational life. While it has the potential to become destructive, conflict also contains within it the seeds of creativity and vitality. Conflict competent leaders know how to address it to make the most of the opportunities it presents while at the same time preventing harmful outcomes. 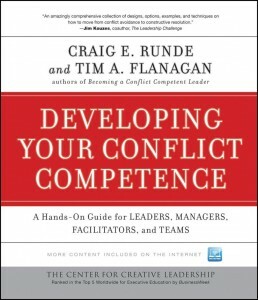 Craig Runde and Tim Flanagan, authors of Becoming a Conflict Competent Leader, are instructors at the Leadership Development Institute at Eckerd College (LDI), a network associate of the Center for Creative Leadership. 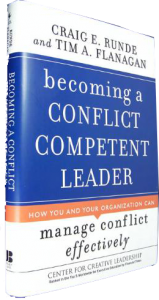 They decided to write the book after becoming convinced that organizations needed to improve the way they handle conflict and that for this to happen leaders needed to champion the process. 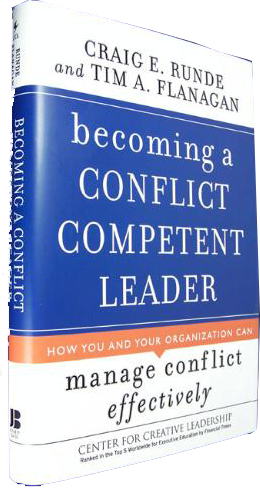 In its opening chapter, Becoming a Conflict Competent Leader explores the importance of conflict competence. This is followed by an introduction to the dynamics of conflict and a chapter aimed at helping leaders understand how they currently view and respond to conflict. At its heart, the book provides practical recommendations for learning how to use constructive behavioral responses to conflict while at the same time lessening destructive ones. It concludes with a chapter about how leaders can work to improve the overall conflict culture of their organization. The behavioral approach used in the book draws from the model underlying the Conflict Dynamics Profile® assessment instrument developed by LDI. – MaryEllen Elia, superintendent, School District of Hillsborough County, Tampa, Florida. Charan, Ram; Crown Publishing, 2001.